My alarm went off at 3:45 a.m. My breakfast was pre-made; my coffee waited in a thermos on the kitchen counter. I got up and out to the motorcycle as quietly as possible, to let my wife sleep. I did not come across any other traffic on my ride through Kansas City, but there were already a few cars in the parking lot of the Ward Parkway Shopping Center. I parked the bike in the far corner of the lot, as I’d been instructed, and walked up to the store. Twenty or thirty people waited by the doors. They were wrapped in blankets, and slouched in a ragged line of lawn chairs. "When did you get here?" I asked the first in line. "About 3:30," she said laughing. The automatic doors were turned off but unlocked; I pried them apart and entered. A few other Crew Members moved around as I walked back to the staff room where I dropped off my jacket and helmet. I punched the time clock at the ‘pit,' over by the cash registers. Outside, dawn began to color the sky. A few more people clustered by the door, looking in. By five, the full opening crew, about 40 people, were in the store. The aisles were still cluttered with cartons of produce that had just arrived. Someone wheeled a pallet-jack loaded with banana boxes across the floor. Dairy and meat products were stacked in front of refrigerated displays, and Crew Members worked to get them onto the shelves of the 'cold wall' before they spoiled. Huge rolling racks of bread had to be put, loaf by loaf, onto shelves in the bakery area, and thousands of apples had to be stacked into neat pyramids. By seven, the sun was streaming through the big plate glass windows, and we could see a hundred people out there, and more arriving. "One hour!" shouted a manager. "Thirty minutes! Make sure you're working clean!" Managers started gathering empty cartons and clearing the aisles; a couple of Crew Members ran big dust mops up and down the aisles. "Fifteen minutes!" Now everyone was running, all the time. 'Highway to the Danger Zone' blared on the P.A. Someone turned the music down, and the staff and managers gathered in the produce department by the front doors. Hundreds of people were massed outside, as if waiting to rush for front-row seats at a rock concert. Mike, our Store Captain said, "A store only has one Grand Opening, and you guys will always remember this one. The main thing now is just to have fun with it." Someone quickly ran down the roster of which eight Crew Members would operate the cash registers, and someone else gave us armfuls of leis to hand out to the first customers through the doors. "And..." it was eight o'clock on the dot, "we're open!" A Crew Member flipped a switch and the doors slid open. That was the last time we were really in control. As fast as we could, Crew Members tossed leis over the heads of customers. "Aloha! Welcome to Trader Joe's." Customers shopping with baskets ran in between and ahead of the ones pushing carts. In the tide of people, I caught a brief glimpse of my wife, then lost sight of her. There were mall security guards at the entrance, and police in the parking lot, but they weren't really needed; the crowd was well-behaved. We should have known that the Grand Opening would be a scene; the 'Bring Trader Joe's to the Kansas City Metro' Facebook page had gathered 5,000 friends. When we ran out of our own carts, customers pushed through with oversized Petsmart and Target carts, scrounged from the far ends of the mall. By the time it was my turn to run a cash register, customers were basically getting into a cash register line as soon as they entered the store; they inched their way up and down the aisles and arrived at the registers long after their frozen purchases had thawed. In spite of that, most of them were in remarkably good spirits. Customers showed off bags they'd bought at other Trader Joe's stores. Many of them told me that they were members of the Facebook group or that, in the past, they'd traveled as far as St. Louis to shop with us. Another common theme was, customers had fallen in love with Trader Joe's when they lived on the coast, then had longed for it after moving to Kansas City. Suburban moms came in and bought three or four reusable bags; a few customers only bought bags. (Trader Joe's bags would be the hip way to carry your yoga mats in Kansas City for the next few months.) Bells clanged as cashiers needed help, which happened a lot; nothing in our brief training had even attempted to simulate this crush of customers. "Will the eggs always be that price?" For the nth time, I explained that Trader Joe's doesn't do sales or specials. Everything was the same price, every day. After two hours on the cash register, I was reeling. I took a few minutes to just walk the floor. Two shell-shocked guys in suits stood in the produce department talking quietly, they had little 'Cosentinos' lapel pins that identified them as managers of a nearby grocery store. Their competitive landscape had just changed forever. Crew Members like me aren't supposed to work overtime, so I clocked out at 1 p.m. when my shift nominally ended, but I felt guilty about abandoning the ship. I stayed another couple of hours helping to bag groceries in a vainglorious attempt to reduce the time customers spent waiting in cash lines. After a couple of extra hours running on nervous energy I realized that there was no way the Grand Opening crush would subside, no matter how long I volunteered to stay. The afternoon shift would have to sink or swim without me. I needed to rest, if I was to survive tomorrow’s 5 a.m. start. The late night clubs and bars were still disgorging Friday’s customers as I rode into work. There was no line of people in lawn chairs waiting for me, but if anything the crew had more work to do, to prepare the store for its second day in business. By the time we opened the doors at eight, there were even more customers waiting. My first week’s schedule called for two opening shifts on that Friday and Saturday, and then a closing shift on Sunday. So, on Sunday I didn’t start until 3 p.m. The store was packed again right until we locked the doors at 9 p.m. It fell to me to do the ‘final cart run.’ It was a perfect summer evening as I gathered up shopping carts that had been abandoned in the far reaches of the parking lot. As I pushed a string of carts back to the store, a Rolls Royce rolled into the finally-empty parking lot. The huge sedan slowed and stopped, and the driver’s window silently lowered. Inside, there were two middle-aged guys in the front seat; their well-dressed wives sat together in the back. "Pardon me..." the driver said, with a dramatic pause. His friend could not quite suppress a laugh. He went on to ask me how late the store was open, and when I told him that it was closed, they drove silently away. I should have said, “It’s a shame you’re too late. Our Dijon mustard’s particularly good,” before the window rolled up. But I was too distracted by the profound realization it was Trader Joe's brand that was bringing in customers, and that the customers themselves were brand-savvy. It’s not like I was the first guy to notice. 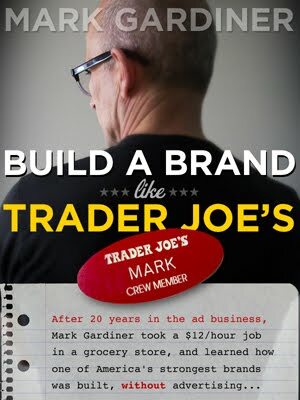 In 2009, Landor listed Trader Joe’s as one of America’s Top-10 ‘Breakaway Brands.’ (They devised the list after analyzing data from Young & Rubicam Brands’ Brand Asset Valuator.) Laurence Knight, the president of brand consultancy Fletcher Knight identified Trader Joe’s as a ‘brand with soul’ two years before that. Dan Hill, whose company Sensory Logic has tried to make a science of understanding consumers’ emotional relationship to brands, has also been citing Trader Joe’s as an example of a brand that’s built a great esprit de corps among both shoppers and employees. Those guys in the Rolls didn’t know that I knew why they were laughing. To them, I was just a twelve-buck-an-hour guy pushing shopping carts in the parking lot. But I’d spent a good part of my working life in ad agencies, persuading clients to invest in their brands, and promising that if they did so, their investments would yield a worthwhile return. I should have been gratified to see my advertising beliefs supported by the evidence of Trader Joe’s Grand Opening weekend in Kansas City. There was just one catch: Trader Joe’s built its incredibly loyal brand following without brand advertising. The company doesn’t even have an ad agency. Nor have they built their brand according to the gospel of social media. In this Web 2.0 world, TraderJoes.com is rudimentary; the company doesn’t even have an official Twitter feed or Facebook page. So, how the hell did they do it? That night, when I got home, I grabbed a notebook and started jotting down my impressions. This book is the result. Great article; I look forward to reading the book. I too, work at Trader Joes after this economy bankrupted my business of 25 years. I finally have a dream job primarily working the wine department and doing wine tastings at the Eastlake #120. If you're ever in just check out "Dave's Fave's"
My mom, my sister and I all shop Dave's Favs at our neighborhood TJs. Great store, great service and we can stay and chat with Dave as long as we want. Thanks Dave! Thanks, Dave. Please come back to the site after reading the book and let me know what you think. Obviously, given the corporate culture, I could not ask for input from the crew before the book came out, but I'm really curious to know what you think. Bummer there is no iBook, went to puchase and nada. Any plans to add? Fantastic! I live in central Missouri where there are no Trader Joe's. I worked with a guy who lived in LA for years. He was always saying "Trader Joe's sells something like that..." or "They have this ______ at Trader Joe's" or "Traveling to Chicago, I hope there's a Trader Joe's near my hotel." or even "AHHH, Trader Joe's has the best...." In the meantime, he's moved back to LA. I've seen and heard of Trader Joe's more often. As a Social Media Administrator and after reading this amazing tease article, I'd love to read the book to see just how you did it. In today's world, not using social media and actually "making it" seem mind boggling. I'm intrigued. How can you say that Trader Joes does not advertise? I live in the West Des Moines, IA area where Trader Joes opened a store a few years ago. I get a multi-page direct mail piece every month or two that is written like a newspaper. That mail piece is definitely not as much about price and item as it is about branding!!! I.E., I address the 'but they _do_ advertise' point on the 'Ten Questions' page on this blog, and in the book. The Fearless Flyer is certainly brand consistent, so unlike a lot of grocery flyers it supports, rather than erodes, brand value. But having worked in the store, I can assure you most customers interpret it to be a 'sale' flyer -- that's probably the result of conditioning by other grocers. Check back in a few days for a blog post with more insight into this. In short though, while you get the Fearless Flyer, the drop is remarkably small by the standards of grocery DM and as the Kansas City Grand Opening proved -- by drawing an enormous, fanatical crowd long before first Fearless Flyer had ever dropped in KC -- the brand flourishes independent of TJ's very limited advertising. Bookshelf: The best advertising is ___ __ ____.